One of the things that has me the most excited about fall at the moment, aside from the slight drop in temperature, is the wardrobe change. 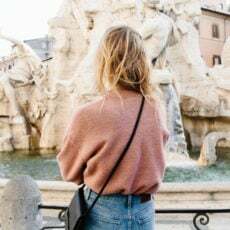 Maybe it’s from our time living in Seattle that has me all nostalgic, but cozy sweaters and layering have me doing all kinds of cartwheels right now. And don’t get me started on the accessories. You know I’m always up for a new hat or a good bag. Which actually brings me to today’s DIY. 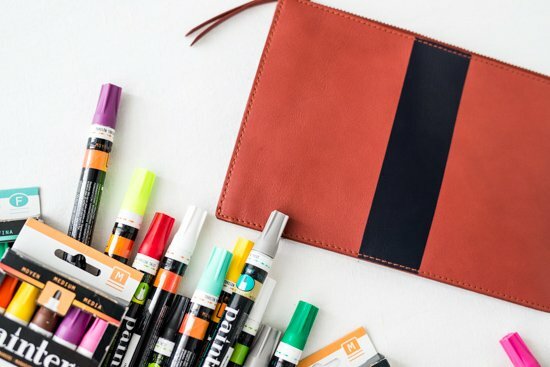 The folks over at Painters (an Elmer’s product) sent me an amazing stash of paint markers to try out on different surfaces (they work on metal, wood, leather, fabric, glass, etc without rubbing off) and so naturally, I decided to play around with something involving a bag…well, a clutch, really (but close enough, right?). 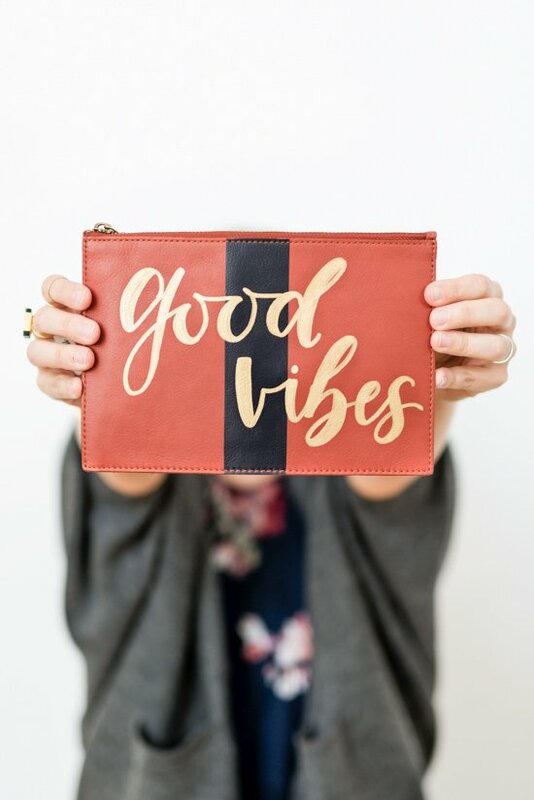 And as a result, have a super easy project idea for dressing up a wallet, clutch, bag, or backpack with a hand lettered message. If you’re not terribly skilled in the lettering / calligraphy department, don’t worry, this project is still totally doable for you. I promise! 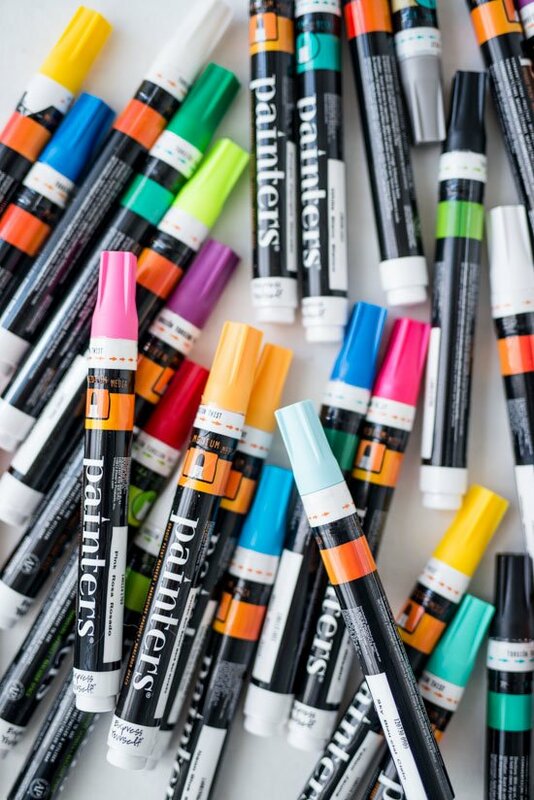 These paint markers are so, so easy to work with, it’s like writing on a piece of paper with a regular pen or pencil. And everyone can do that! So, let’s get to it. Here’s what you’ll need to hand letter your own leather accessories. Hint: You’ll only need 2 items! 1. 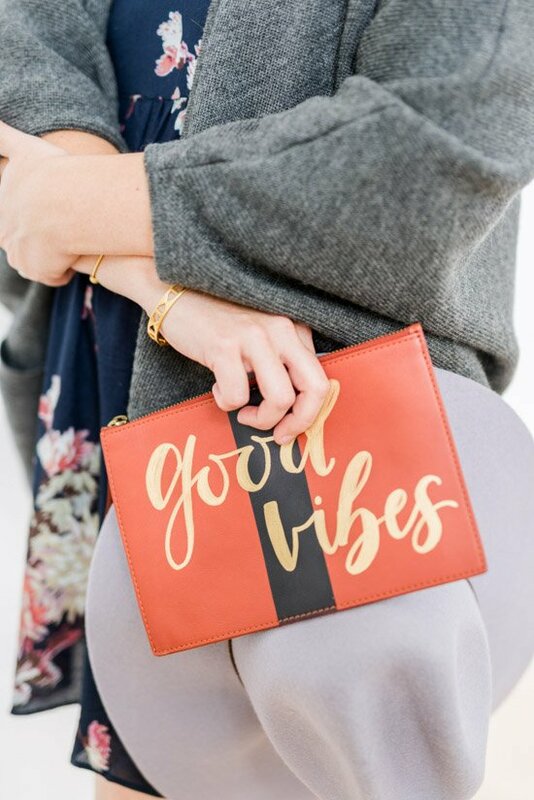 Decide on a phrase or word for your clutch. We went with ‘good vibes’ but also liked bonjour, super duper, je t’aime, ¡Hola!, killing it…I could go on and on. 2. Next, cut a sheet of paper the same size as the item that you are lettering. So you can practice and get the size of the letters and the placement just right. 3. 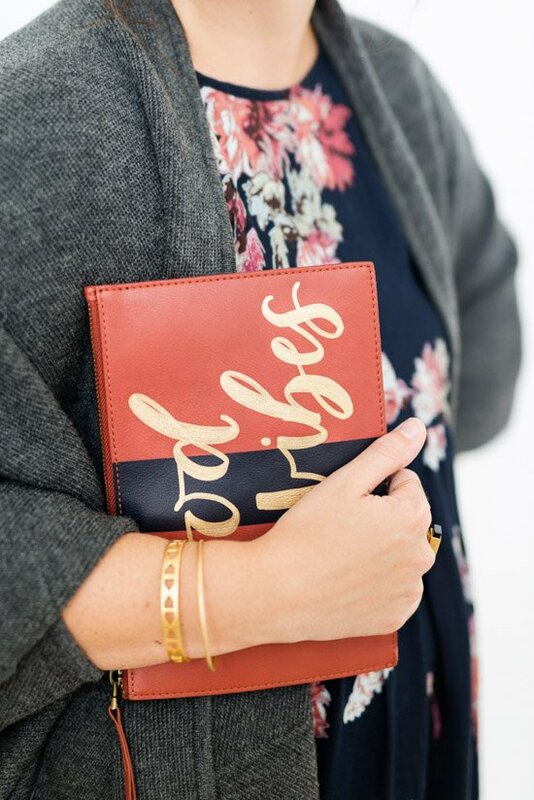 When you’re ready, simply write your word directly on the clutch, in cursive. Try to keep a loose, even flow and don’t pick up the paint marker from the surface until the first word is complete. Then, finish the rest of your phrase the same way. Give the paint a few minutes to dry before moving on to the next step. 4. Now it’s time to thicken up some areas to create more of a bold (and easy to read) statement. Any down strokes (parts of a letter that your marker moves downward on) draw a parallel line. See image for reference. *At this point, you can choose to very the width of the lines or keep them all the same width, based on your preference. Again, give the paint a few minutes to dry before moving on to the next step. 5. Once step 4 is complete and the paint is dry to the touch, fill in between each set of lines that you drew in step 4. And touch up any areas as needed. Wait for the paint to dry and it’s ready to use! So simple. Right? I told you it was easy. And now that you know just how simple it is to tackle a project like this one, I’m curious to know if you’ll give it a try? If you want to join in on the Painters fun there’s a fun monthly Painters contest going on, now through the end of the year. Each month is a different theme (based on based on different store ‘aisles’) and each monthly winner will receive a prize valued at $500! This month’s theme (October) is clothing, accessories, and shoes. And I would love to see what you come up with! 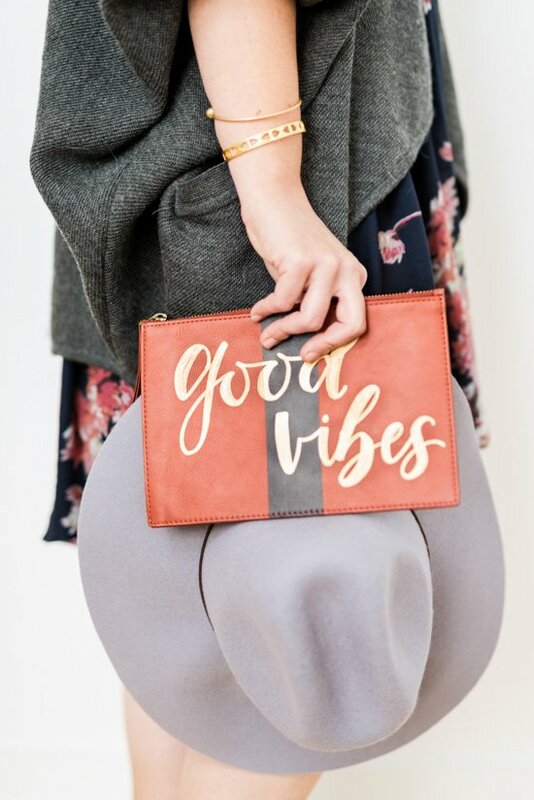 There are so many uses for these paint markers..in fact, after we photographed this clutch, I realized painting colorful details on the metal bracelets I had just bought would be another fun way to use these guys. Anyway, you can submit your projects to elmers.com/painters, download a coupon for Painters products, and share your creations on social media with #StyleByAisle and #PaintersStyle. 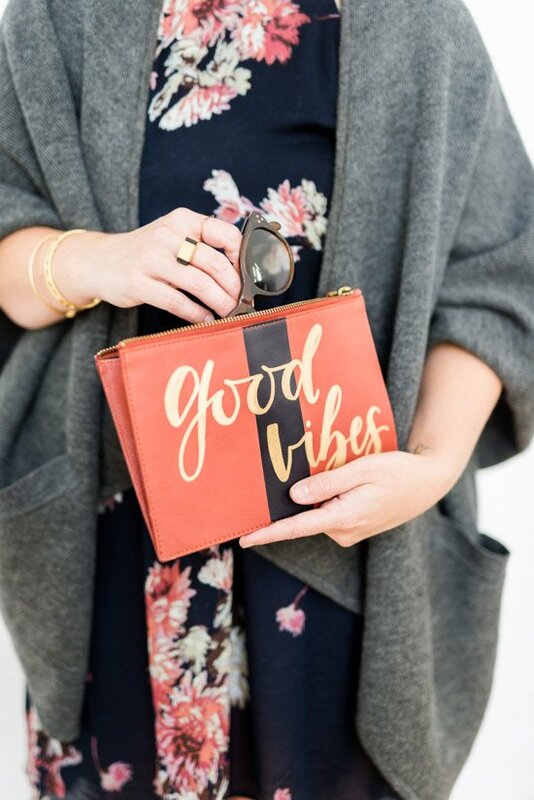 Think you’ll give this clutch revamp a try? What saying would you choose? This post is in partnership with Painters. Thanks for supporting the brands that help keep Paper & Stitch running. Brittni, Love the way the clutch looks. I wish I could write freehand and have it look so good. Wow this is so cute and simple! 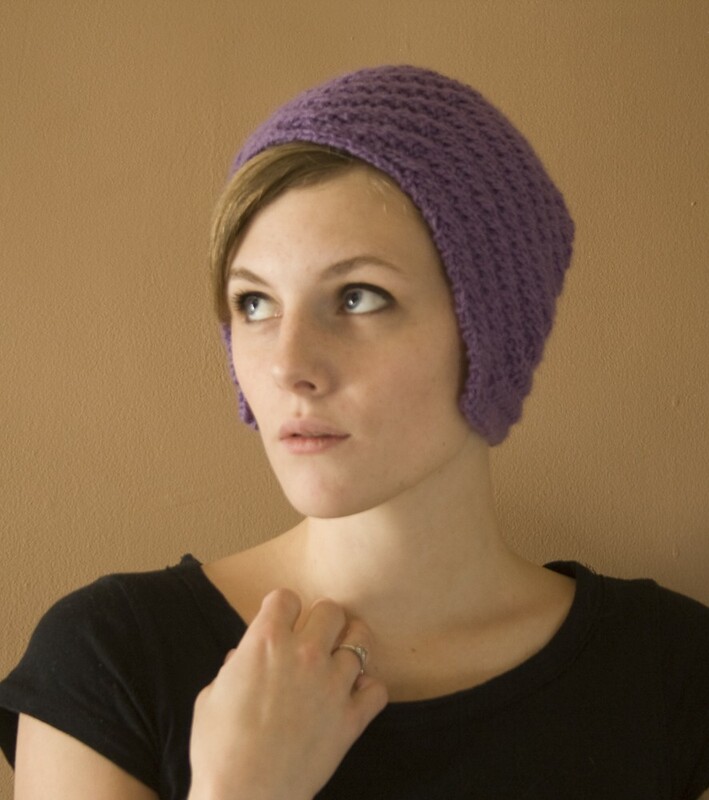 Can’t decide if I want to do it for myself or give as a gift…maybe both ! I wish I had fabulous handwriting like you! What a great idea! I would have to find someone with great handwriting to do this for me. Very cute. So cool and chic. I’ve never even heard of painters! Now I need to go find a cute clutch at the thrift store! 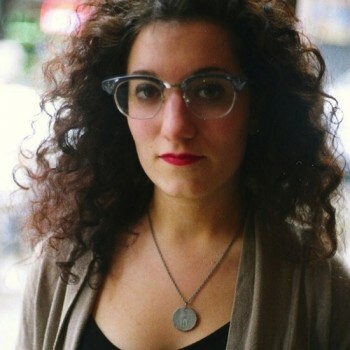 I wish that i could write like you! these are beautiful! Wow, well that’s easy enough!! I thought it was a printout at first! Super cute! This is such a great idea. I don’t have beautiful handwriting like you do but if I did I would so do this. The clutch you used was from Madwell – cannot find the one w/ black stripe. Did you paint the black stripe? Hi Kathie. I bought it in store with the black stripe on it (I didn’t paint that part on), but I could only find the plain colored one online. So, I’d recommend trying a local store if you can. Hope that helps.